By default, iTunes or iCloud will sync your contacts in bulk, with little control over the process. With iMazing, it becomes easy to transfer contacts from your computer to your iPhone, or the other way around – sharing contacts securely, without syncing, and outside of the cloud can be done in just a few clicks. vCard files – the standard format for electronic business card. 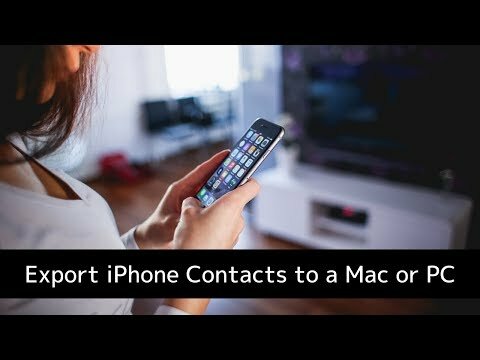 Anyone who wants to transfer contacts to their iPhone, iPad, or iPod Touch without syncing, and outside of the cloud. Launch iMazing and connect your device. In the left sidebar, select Contacts. To view your most recent contacts, you may need to refresh your data. In the bottom toolbar, click one of the Import buttons. This will open the Contacts import Wizard. In the Wizard, select the contacts you want to copy from your computer's Contacts, and click Copy to Device. Your contacts will start being transferred. To import contacts from a file, skip this step. To import contacts from a vCard file, click Choose. This will open the a dialog box. Select the vCard you want to import, and click Choose. Your contacts will start being transferred.  Tip: You can drag and drop a vCard file directly to iMazing's Contacts view to import it to your iPhone or iPad. Apple menu > System Preferences > Security & Privacy > Privacy.